Saying it's recent maneuvers meant Hezbollah was not willing to merge into the Lebanese society anytime soon. BEIRUT: The Lebanese Option Group (LOG) hit out at Hizbullah on Wednesday, describing the recent "maneuvers" recently undertaken by the party as a "blatant demonstration that Hizbullah as not willing to merge into the Lebanese society any time soon." During their weekly meeting, LOG also condemned military maneuvers conducted by Israel along its border with Lebanon. New Lebanese Option Gathering (LOG) believes as much as 50 percent of the Shiite vote in Lebanon is up for grabs. Insists they have big objections to March 8, especially its intimate links with Syria. BEIRUT: The founder of a new political party with the stated aim of giving Shiite voters a third option, apart from Hizbullah and the Amal Movement, believes that as much as 50 percent of the Shiite vote in Lebanon is up for grabs. Ahmad al-Assad says that his new Lebanese Option Gathering (LOG) will attract voters whose interests do not fall strictly in line with either of the two main Shiite electoral blocs. While the gathering politically supports what Assad refers to as the ideas espoused by the March 14 Forces, he insists the LOG is politically independent, but at the same time says they have big objections to the March 8 movement, especially its intimate links with Syria. Assad, who also heads the Lebanese Kafa'at Party, said statistics show that 50 percent of the Shiite community in Lebanon has no political preference. "With time and hard work we can bring them under the Lebanese Option Gathering's umbrella," Assad said in a recent interview with The Daily Star. He said the Shiite community has a vested interest in building a strong and united Lebanon as the path to ensuring security, stability, economic growth and development and to put a stop to the migration of youth abroad. "We want the Shiite sect to be part of state-building efforts," Assad said. "Hizbullah feels that its military, ideological and political links with Iran are more important than its commitment to Lebanon." The use of fear tactics by Hizbullah, he asserted, has silenced many dissenting voices within the sect. LOG would allow Shiites to express their true political convictions, he said. "We have a big problem with the March 8 movement, its name marks the date for a political demonstration to express loyalty to Syria," Assad said. He added that among the LOG's objections to the March 14 Forces is their performance in power to date, in particular the security file, which he said has not been treated with the seriousness it deserves. Asaad hails from a wealthy Shiite family in Southern Lebanon. His father, Kamel al-Assad, was Parliament speaker four times, from May to October 1964, from May to October 1968, and from 1970 to 1984. 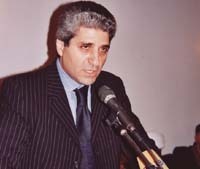 He presided over the elections of three presidents: Elias Sarkis, Bashir Gemayel (a close friend and ally) and Amin Gemayel. After the collapse of the May 17, 1983, agreement for the withdrawal of Israeli and Syrian forces from Lebanon, Kamel al-Assad resigned as speaker. He boycotted the elections in 1992 and 2005 and failed to win election in 1996 and 2000. LOG's secretary general, Ahmad Mattar, said the gathering groups together the Kafa'at Lebanese Movement headed by Assad, Shiite political activists, former Baathists and communists. He said that while membership in the gathering is currently confined to the Shiite sect, in time that would change to encompass members of other sects. "The Lebanese Option Gathering is a political movement working toward a state of security and law, a sense of national belonging, and resisting outside influences and obligations to foreign interests," Mattar said. He said the gathering is also opposed to confining any sect to a single political direction.